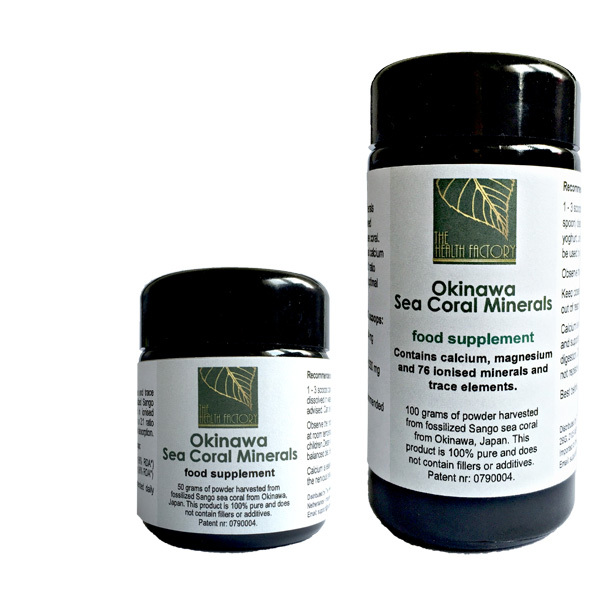 The Health Factory’s Okinawa Sea Coral Minerals is manufactured under a patented process. It is this process that activates the minerals so that they become ionized when exposed to water. * percentage of the recommended daily allowance. Contains 76 ionised minerals and trace elements derived from fossilised Sango sea coral. Particularly rich in ionised calcium and magnesium, in a 2:1 ratio which is appropriate for optimal absorption. 1-3 scoops daily (of supplied measuring spoon) dissolved in water, juice or yoghurt, unless otherwise advised. Can be used by all the family. Observe the (recommended) daily dose. Keep closed at room temperature and out of reach of young children. Calcium is essential for teeth and bones and supports the nervous system and digestion. Dietary supplements should not replace a balanced diet. Packaging: The Health Factory package this product in the highest quality dark violet glass which allows only the positive infrared and ultraviolet light to pass through, resulting in longer shelf life.